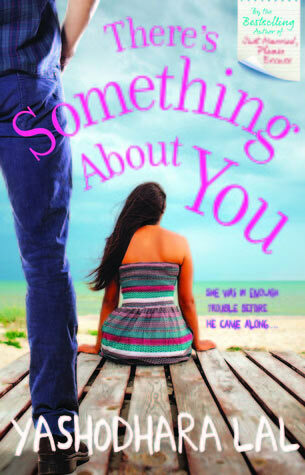 ‘There’s Something About You’ by Yashodhara Lal certainly makes for an entertaining, light read. The story revolves around Trish. Now, Trish is a twenty-eight year old girl, recently unemployed, overweighed, single girl, who hides behind her sarcasm to cope with the world. Before you think that how a character with such a hopeless case make a good story, then I must tell you that only such a character could have made this story, and only Yashodhara Lal could have done such a marvelous job at it. Once Trish loses her job owing to several factors, including her disability to change with the world, she finds herself in a pathetic situation, struggling with finance, her ever-complaining mother and ill father. She is unable to find another job, because she had never done any work in building herself a good profile and ‘personality’ while being in her comfort zone. Anyhow, in her drought life two significant changes bring a little respite. One, a colleague from her office, who she didn’t like much, offers her a freelance work. Two, she saves a boy from ending his life in a suicide. The freelance work ultimately turns into an “Amy Column” (in the line of Agony Aunt). Though she is frustrated by the contract terms that forces her to keep Amy’s identity anonymous, she takes the work for awesome money she was offered. It is because of this column she meets a boy named Sahil who supposedly has some psychic powers. Towards the final quarter of the book the storyline picks up pace and is full of twists, turns and secrets. Though, no matter how much I ache to tell them all, I cannot post the spoilers and you’d have to read them for yourselves. Coming to the review, for the first half of the book I felt that the plot was weak and lacked a clear direction. Though, some people are placing the book in the “Romance” rack, I don’t think that angle is anywhere strong enough in the entire book. But, then, I’m not saying that it’s a bad thing. The characters, well, have been written rather well. The reader is sure to identify himself/herself with the in-lead Trish. I did, you would too. Each other characters receive their own space, their own traits, and Yashodhara has done a marvelous job at making them all realistic and easy to comprehend. Whether it is her peevish mother, or her ill father, her only friend Akanksha or Akanksha’s daughter Lisa, Zee, her evil employer or Nivedita, the poor mediator between Trish and Zee, none of them couldn’t have been written any better. And, not to forget Sahil, the man with powers. His own troubles with his parents, mixed with his qualities to impress just anyone adds a freshness to the plot. The language and writing style is, no doubt, great. Yashodhara has successfully mixed simplicity with flow and flamboyancy, making the book an entertaining read. Since, the protagonist herself is shown to be in ‘content development’ area herself, using appropriate language and vocabulary for her could have been a challenge, but it was done perfectly. The pace seems stagnant at some places, but overall it’s paced well, especially in the end where it picks up drastically. And, the book’s resolution is surprisingly fantastic. I could never have imagined from the book cover, blurb or first half of the book that it was going to end the way it did. It’s excellent with the surprise factors, though for the most parts they’re a bit tragic. Overall, the book is a light read, entertaining, well-paced. Captivating writing style, excellent characterization and unexpected climax are a bonus. Overall, the book is a light read, entertaining, well-paced. Captivating writing style, excellent characterization and unexpected climax are a bonus. I totally recommend it.